Participants in Los Angeles’ annual pride parade acknowledged the attack during a day usually reserved for celebration. San Francisco’s City Hall displayed the colours of the LGBT pride flag. Blood donors lined up to help the wounded victims. 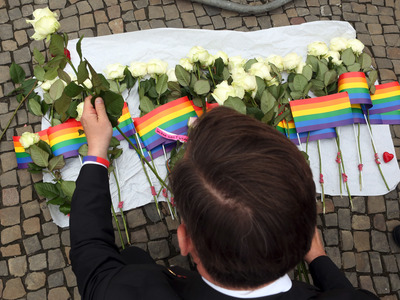 In Berlin, white roses were wrapped in pride flags at a makeshift memorial. Author J.K. Rowling mourned the loss of a young man who operated the “Harry Potter and the Forbidden Journey” ride at Universal Studios in Orlando. One World Trade Center lit up in the pride flag’s colours. 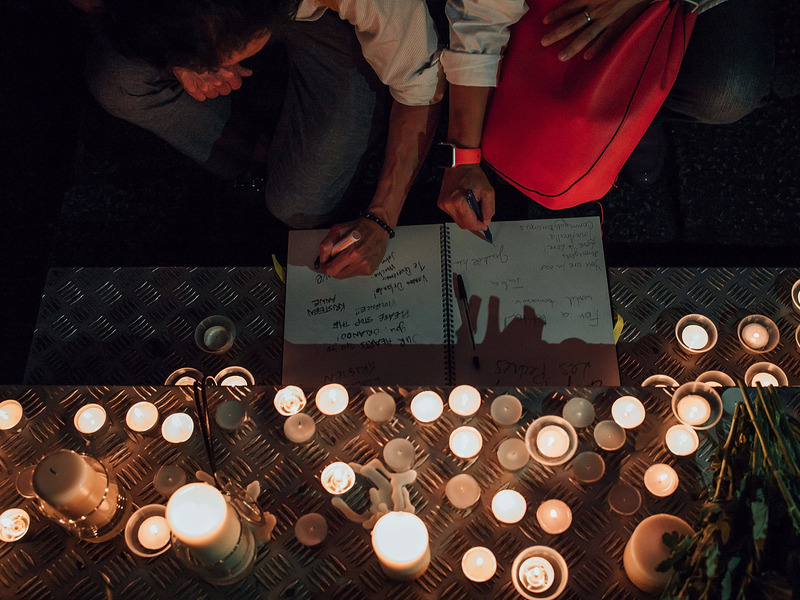 Mourners lit candles and wrote messages at a vigil in Hong Kong. The cast of “Hamilton” performed without prop guns during the Tony Awards telecast on Sunday night. The Orlando Gay Chorus performed “You’ll Never Walk Alone” at a prayer vigil for the victims at Joy Metropolitan Community Church. A prayer vigil to honour the victims from Pulse was held at the Joy Metropolitan Community Church. Orlando Gay Chorus sang “You”ll Never Walk Alone” in honour of those who where affected by the tragedy.Solidarity by J.D. Casto is licensed under a Creative Commons Attribution-NoDerivatives 4.0 International Licence. The Orlando Eye lit up in pride colours. The Newtown Action Alliance, an organisation formed after the Sandy Hook school shooting in 2014, held a roadside vigil. New Yorkers created an impromptu memorial at the Stonewall Inn, the site of the 1969 riots that catalyzed the LGBT civil rights movement. Adele cried as she dedicated her concert in Antwerp, Belgium, to the victims. Mourners observed a moment of silence at a vigil in Atlanta, Georgia. A Muslim man donated blood to help wounded victims, despite the fact that he is fasting for Ramadan.